Use this Choice 8 qt. stainless steel mixing bowl with its silicone non-slip base to add a great, useful addition to your kitchen. Featuring a thin coating of silicone on the bottom, this bowl is a step-up from your typical mixing bowls as the base stops the bowl from sliding around on your counter or workspace. This helps prevent common kitchen spills that can occur when stirring or moving about a busy kitchen. Plus, since the non-skid base is made of silicone it resists heat and chemicals better than plastic for long-lasting durability. The non slip on this bowl is awesome i am so happy that there is a product like this out there. Thank you so much. For personal use I have some of these from another store - these are a ton nicer (and can be used in my restaurant)! Perfect size, nice deep sides! These mixing bowls with the non-slip base are great to work with. I don't think I will ever buy a mixing bowl for my bakery that does Not have such a non-slip bottom. The mixed material bowl (the stainless, the rubber bottom) has held up very well and I expect to get more years out of this product. I love this non-slip bottom bowl, having the non-slip grip on it makes it so much easier to stir the dry ingredients with just one hand while freeing up my other hand to pour my wet ingredients without having the bowl slide all over the counter. The 8qt stainless steel mixing bowl with silicone base is the perfect size for proofing large batches of dough. It also works for mixing and tossing salads. The 11.5" rim makes the bowl small enough to fit in most upper kitchen cabinets. All the other bowls in the set fit neatly inside this one. I have had these bowls for several years now. No dents, no dings. The non skid base keeps it still while I'm wisking. Easy to clean. I bought one of these to try for use in my artisan bread making. My wife loved it so much, she took the bowl over. I ended up getting her a full set so I could get my bowl back. Good sturdy bowl without being too heavy. i use this bowl for my large cake batters. I love that the bowl is very sturdy. It is very good quality and I would highly recommend this to anyone! I need to buy more!! Very well constructed bowl with a solid grip bottom. The bowl is pretty heavy, so it doesn't move at all when mixing solids or liquids. Price for this item was definitely on point, as well. Similar mixing bowls cost quite a bit more at department stores, even on sale. For mixing medium to large quantities without spill, I would definitely recommend this item. It is affordable and well constructed, so it can take a beating for years to come. These bowls are as functional as they are attractive! I made myself a complete set (items: 922MB03-EA, 922MB05–EA, 922MB08–EA, 922MB15–EA). At this price point, they make great gifts as well. This bowl is awesome! I love the non-slip bottom. They were not joking about non-stick, it will not slide around on you. You could find a cheaper bowl but you will not find a better bowl. Its heavy duty but still light. Wonderful bowl! I really like the rubber, non-slip bottom of this bowl. It doesn't budge while I'm mixing away. This is also the best price I found on such a great stainless steel bowl. This is a good size mixing bowl to have on hand - easily big enough to hold a few batches of cookies and the rubber bottom helps it to stay in one place on the counter. So happy with the purchase of this 8 Qt. Heavyweight Stainless Steel Mixing Bowl With Bottom Grip/Non-Slip Base . It's perfect to do the mixing and folding with one hand. The silicone base will prevent the bowl from moving. I would love to have a lid for this bowl. I love this bowl for making macarons. The non-slip grip on the bottom helps make it easier to fold the batter; when I have to make them in other bowls I notice it's a lot harder for me/I get tired more quickly when folding. I love love my new found treasures, will be ordering a bunch more of these stainless steel bowls. only bought one to make sure, so beautiful. This is perfect for mixing batters and things if you like to do double recipes at home. I really like the non slip bottom. You don't have to chase the bowl around the counter. Love my mixing bowl.....very sturdy, no mess while using it. i love the stainless look, the size is perfect.....will definitely buy more ,and also recommend it to anyone. This heavy weight stainless steel mixing bowl is a great quality, durable, yet light to handle bowl for so many purposes. I use this bowl for a ton of things including mixing huge batches of foods, but also for filling ice buckets or chilling drinks. It's quite large (for family use) and useful for so many things. This is the one bowl that seems to get carried off by everyone in the family who needs it for something. I love this bowl and am really surprised at the low price here at Webstaurant! You can't go wrong with this purchase. This larger 8 Qt mixing bowl is a must have in the kitchen. The bottom is silicone and will stay put on the counter when in use. It is made of durable heavy duty stainless steel, has a nice finish and design and the large rim makes holding it securely easy. Wonderful bowl! We love this bowl, It is sturdy and I can effectively stir cheesecake batter with one hand and not have to hold down the bowl. In my book, this is amazing! Couldn't be happier with this bowl! The non-slip base works perfectly. This size is great for mixing double or even triple batches of baked goods. We also use this bowl when straining our broths or defrosting meat. I love the fact that these are very lightweight but still very strong, super useful because they don't slip. Easy to clean and they look great at our service bar. I love both the size and the strength of this bowl. I prefer to use stainless steel when mixing anything the uses butter or oil, as it cleans up much better. Great, sturdy, easy to use and clean stainless steel mixing bowl. Holds a lot, rubber bottom gives it extra support when mixing batter and such. Excellent mixing bowl that is wide enough to not feel cramped for space when hand-mixing ingredients. I love the rubber non-slip base, doesn't slide around on my counter. Very easy to wash.
Really nice bowl! 8qts is really a lot it's deep so it holds a lot! Non slip is not a must buy for this price it is worth it. Must have in kitchen great product dish washer safe. I needed a bigger bowl for my kitchen at home so I opted for this one over the standard, non-rubberized based bowls. There is a very noticeable difference between the heavyweight bowls and the standard ones; the added weight really makes it feel that much more durable. Of course, the non-slip base works really well when mixing denser foods. I don't think I'll be able to go back to the lightweight bowls after having used this one. This large size is excellent for prepping large batches of vegetables (or what ever you need prepped). We loves these bowls and would purchase again. When I purchased this bowl my intention was to leave it at work because we don't have a large mixing bowl there. That never happened. I fell in love with this lightweight (not like my super heavy glass mixing bowls) bowl. It is large but very easy to control due to the grippy bottom and large lip (easy to hold onto). I really like this bowl and the rubber non-slip base. I am still not sure if its okay to double boil in this bowl because of the rubber bottom, but I am sure it's probably not a big deal. The sides of the bowl are narrow and tall so don't expect to fill the bowl too much. this is great for making big batches of food / mixes or anything! i use these type of bowls for my bakery and everythnig fits nicely! The 8 Qt. 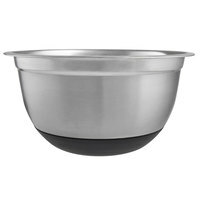 Heavyweight Stainless Steel Mixing Bowl with Bottom Grip/Non-Slip Base is solid and sturdy. It's big enough to mix up a large batch of monster cookies. The non-slip base is very helpful when mixing a stiff batter. Highly recommended. A great big bowl that's perfect for mixing pasta or potato salad in. The non slip base is great and allows me to mix with both hands. This bowl is awesome! I always wanted something like this, not knowing they existed. I am happy to have found this, it makes making dough a breeze! When they say Extra Heavyweight, that's an understatement! High quality, brilliant polished, well made bowl, that won't easy slip off counter-top. Webstaurants usual prompt shipping and great prices make this an easy decision. An amazing bowl to buy. It has a non slip bottom which helps tremendously when making, whisking, stirring sauces. I will be purchasing more in the future. These owls are really great for hollandaise and other egg based custards. The thickness helps distribute and controll heat while cooking. Also great for whipping cream because they also hold the chill longer. it's good idea to have that grip/non-slip on the bottom. Perfect for kneeling dough and mix salad. it's also very easy to clean as well. This bowl is great for triple recipes because of its depth. It is easy to make batter and mix icing in these bowls since there is a silicone base keeping it still. The size is large, but perfect for big jobs! This is a great mixing bowl, very strong, bottom nonslip. I like these bowls, they are the best bowls, I am back to buy more and more.